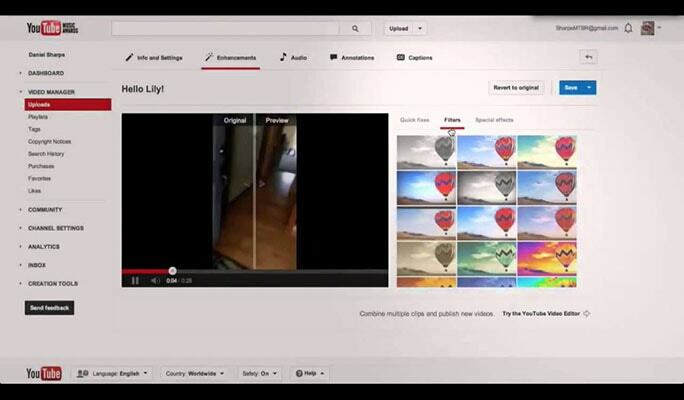 The best editor helps you easily edit YouTube video with powerful features. Are you looking for YouTube sponsorship? Getting YouTube sponsorship for small channels might seem to be a very difficult goal. Whenever the word sponsors strike your mind, you think of the big and expensive commercials. However, if you lower your expectation from the big commercial companies, there are several other companies in the market that can help you with the YouTube sponsorship. In this article, you will learn how to get YouTube sponsorship and make money out of it. As you are a small channel, you must be very cautious about the YouTube rules. Never put up any abusive content on your channel that degrades the value of YouTube. Ensure that your channel’s content fits the directions and guidelines of YouTube. The supporters of YouTube sponsorship for small channels would never wish to get associated with channels that might be erased due to the strategy infringement of YouTube. So, be careful before uploading your content. The content you offer through your channel must offer valuable content. Not just that, you must have a library of valuable content so that the potential sponsors can browse through several materials in your channel. Uploading once in a blue moon or just a few contents in the beginning and expecting YouTube sponsorships to pour in is not the way out to acquire supporters. Always add a business email ID to your channel, which shows that you would love to receive business inquiries. This is the ID where you will receive notifications for friend requests, video comments, and even the battering messages once you have a large fan following. If you are searching for YouTube sponsorship for small channels, Famebit is a trusted platform that can be considered. It is an interface for the advertisers and the video creators who require sponsorship for their content. Utilizing Famebit can be beneficial in acquiring more than average amount of cash as it is added by Google. If you have 5000 endorsers for your channel, you can very well utilize Famebit to obtain YouTube sponsorship for small channels. You can explore various items like contraptions, innovations, designs, and more when you get to their commercial center by making a free record. Famebit charges 10% of the sponsored amount and the installment is made by check or PayPal. Reaching out to the people directly is one of the tried and tested ways to acquire YouTube sponsorship for small channels. Research and try to find 50 to 100 companies that would be interested in your channel. It will not be much difficult to search that one person within this list whom you can connect with directly. Once you have the company’s list and detailed contact information of those companies, send a mail inviting them to check your channel and show your interest to partner with them. It is essential to make yourself stand out in the colossal crowd. Ensure you channel is unique and somewhat different from the rest because the contacted companies keep receiving partnering submissions from several other content creators too. One important thing is not to send out same old letter to all 50 companies and keep hoping to receive a positive response from at least one. Try to focus on your channel’s USP and highlight the same in your letter to the companies while trying to contact the companies for YouTube Sponsorship. The trade shows and exhibitions are a great way to search for YouTube sponsorship for small channels. The exhibitions that focus on new media gives a huge platform for you to find a sponsor when you participate in it. Such events offer tricks and tips, helps you to talk to other content creators, and also lets you connect with the brand managers who can offer your channel with YouTube sponsorship. When you are searching for sponsorship for a particular product, ensure that it is relevant to your channel. Never approach the sponsors without ensuring the same as you might put off your viewers and your sponsors will not achieve their expected results. You might lose both your sponsors and audiences in such a case. When you try to get YouTube sponsorship for small channels, it is quite difficult as the promotion of the product becomes limited to whatever small following they have. Product reviews and tutorials are the best ways to obtain product sponsorships. Among all sponsorships, the paid sponsorship is the most challenging one. Usually, when you review the products of the affiliate links in your videos, you earn revenues, but, in the paid sponsorship you earn by advertising product and company links on your channel. When you add the company’s products in your videos, you earn money. It appears at the beginning and at the end of your videos after it is played on your YouTube channel. It is the easiest of all sponsorships but also the least revenue generating one too. Affiliate sponsorship works by sharing affiliate codes and links. It is used by your audiences to obtain discounts or offer you a reward. There are two types in which the affiliate sponsorship works. One is the discounting option where the code is shared and the viewers use these codes to get discounts anywhere between 5-15% in shopping products from that same site. Another option is to use the affiliate code to integrate it into an URL which offers profits to a content creator in form of traffic. Not just the popular channels, the newbies can also earn the YouTube sponsorship when they know the way outs. Follow the above tricks to get the youtube sponsorship for small channels without many efforts. If your content is unique and your process to reach the sponsors is right, you can definitely make money through this medium. If you want to edit YouTube video, Filmora can help you with its powerful features.